You've probably seen those expensive closet organizing systems that make your closet better organized than your kitchen. These are wonderful products if you are looking for top-of-the-line, but if you want the same results...organizing your closet effectively...but don't want to spend a lot, read on. Closet organizing on the cheap means you are willing to spend time and creativity in exchange for saving money. Here are some simple and effective ways to save money on your next closet makeover. -- Use what you've already got. 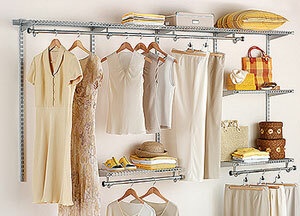 Fancy baskets, bins and shelving units exist to help you sort, store and stack items in your closet. Mismatched bins, woven baskets and boxes do the same thing. Assemble all the storage containers you currently have and take a good look at them. Which ones stack? Do they have handles that can be removed? Do you have odd pieces of wood or old shelves you can recycle in your closet? Cardboard boxes and packing tape mean you have any size bin you need. Cut apart your boxes and reassemble to the exact specifications for your closet organizing project. Often you can pick up more boxes for free just by making a trip to your local grocery store and asking for their leftover boxes. -- Think (other people's) used. Check out your local thrift store. Sometimes you can find old dressers that will fit nicely into your closet and provide you with excellent drawer space. Make your own dividers out of sturdy cardboard and you'll make the most of your secondhand find. You might also find decorator boxes or bins that will work in your closet organizing project. It's a good idea to take along your closet measurements to the thrift store so you'll know exactly what will fit before you buy and drag it home. Another hint: while you're at the thrift store look for any old-time heavy duty hooks that would work in your closet. These large, metal ornate hooks are back in style right now and cost plenty when purchased new. Properly mounted, they can hold a lot in your closet and do so beautifully. Your closet organizing adventure is based on creativity and that includes how it looks. After you get all your shelves, bins, boxes and baskets assembled, it's time to decorate them. You can spray paint everything the same color for a coordinated feel or opt for a true decorator look by pulling together paint, fabric and wallpaper for an amazing custom look. There are many excellent do-it-yourself books available to give you ideas and get your creative juices flowing when you arrive at this point in your project. (Check at your local library) One I like is "Easy Home Organizer" by Vicki Payne (published by Sterling Publishing Co. copyright 2007). She offers fun ideas for covering and embellishing cardboard boxes in the office and her ideas would easily translate to any cardboard storage system including the one in your closet makeover. Be sure and line the inside of your bins and baskets, too, if necessary, to ensure a smooth home for your closet items. Doing a closet organizing makeover on the cheap can be a lot of fun as well as a great way to save money. By taking the time to plan out your project and use what you already have on hand, plus supplementing with recycled materials you can end up with a customized project that looks great and gives you a closet space that works hard for you, too.